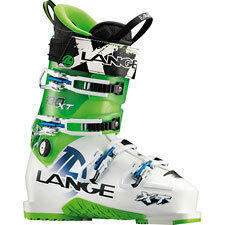 Lange officially enters the Alpine Touring market with the XT 130, a Freeride ski boot offering excellent downhill performance plus a first-ever Lange walk mode. Fit options are impressive: two shell widths and two different flex profiles, plus a short-cuff version for women. Fit itself is very much in the race/performance tradition—close and firm, with a modern Alpine liner that envelops your foot and holds it securely in place. The tongue is outstanding. In short, without that walk mode switch on the back, there is nothing here to dissuade you of the notion that you are in fact wearing a full-on Alpine ski boot. I snapped into my Gotamas, pointed them downhill, and was immediately rewarded with all the hallmarks of a Lange ride. The boot is quick and active, and unbelievably clean. You get just the right feedback from the snow, and a deep progressive flex that is inarguably a tad softer than what you'd get from a Lange racing boot, but still exactly silky-sweet right when it comes to transferring energy from skeleton to ski. Where the XT goes awry—insofar as touring is concerned—is what happens when you flip the switch from downhill to walk mode. What does happen? Not very much. I have become used to dealing with Alpine Touring ski boots that are so soft I sometimes get fooled into thinking they're in walk mode when they're actually set to ski. With the XT 130, the reverse is true: even with the switch set to "walk", you may indeed think you're still in downhill mode. Range of motion is very, very limited with the XT 130's walk mode. There is no way to sugar-coat it. The XT in walk mode gives you an extra bit of motion that isn't all that much different from what you get just unbuckling your boot completely. It's better, yes, but this is no kind of walk mode you'd want to spend any serious time climbing or touring in. So, this is the tilt Lange has given us: downhill performance has been maximized. Touring performance (and weight) is mostly afterthought. That places the XT 130 in a very skinny niche. There are new touring options (Maestrale RS, Cosmos) that deliver a very credible in-bounds ride. And there are walk mode-enabled Freeride boots (BD Factor, Tecnica Cochise Light) that can climb. On the downhill, I know firsthand (or strongly suspect) the Lange XT crushes them all. But if you really are buying a boot for some degree of authentic climbing performance, I think you have to look elsewhere. That said, you won't go wrong picking the XT 130 as a sidecountry or predominantly in-bounds boot—and I bet a more touring-capable Lange isn't too far off the horizon, either.